Orfeo Fioretos, "Origins of Embedded Orthodoxy: International Cooperation and Political Unity in Greece. 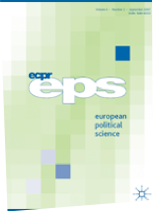 European Political Science 12 (September), 2013, 305-319.
International organisations have considered national unity a necessary prerequisite to maintaining political stability and restoring economic growth in countries facing severe economic crisis. The European Union and the International Monetary Fund promoted such unity in Greece when making stabilisation packages available during the country's sovereign debt crisis in 2011–2012. Focused on the conditions under which diverse political groups can credibly coordinate their economic and political strategies, this article examines domestic and international factors that impact the prospect of political unity in Greece and small European economies. Anchored in the historical institutionalism tradition, it finds that political unity in small European economies has been consolidated during periods of economic growth and when complementary international institutions existed, but has regularly been undermined in countries experiencing the opposite conditions, including Greece. National unity in Greece over the long term requires domestic reforms, but such reforms will not be sustainable without external economic growth and a multilateral architecture that incentivises economic groups to share the benefits and costs of structural reform. Since the latter conditions are not ones that a small country itself can produce, sustained political unity rests as much with the actions of big economies as it does with Greece overcoming the historic legacies of its particular model of capitalism.